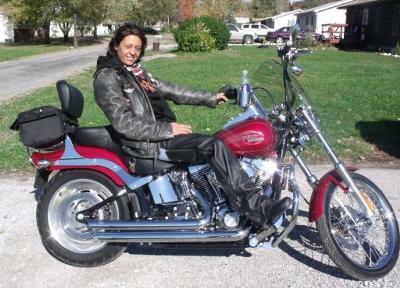 She's a 2007 softail custom. She ie so good to me, and I the same. She's the love of my life for sure!!! Please talk to me of Serenity? Hi, I just posted a very long saga of my first day, my first introduction to a Softail Custom, and the impact it had for me. I will not repeat the story here, but hope you can take the time to read it. I am 5"4 and will be putting a lowering kit on the bike. Can you tell me if you rode a cruiser with floorboards before you got Serenity and how you find the ride with Serenity now? Does the skinny tire cause any more difficulty than the fat tires on the deluxe? Do you miss floor boards? Is the comfort on long cruises ok? Does the softail custom ooze with attitude and are you excited? Had you contemplated the Softail Deluxe at all, or just always want the Custom? I am excited to hear about how you got to pick your Serenity, and how that came to be and how the rides are and how the love life with it has progressed?